Following my post about holidaying with friends on Tuesday, I wanted to compare Airbnb and Couchsurfing today. Airbnb allows you to rent someone’s place for the holidays, you can read my review here. 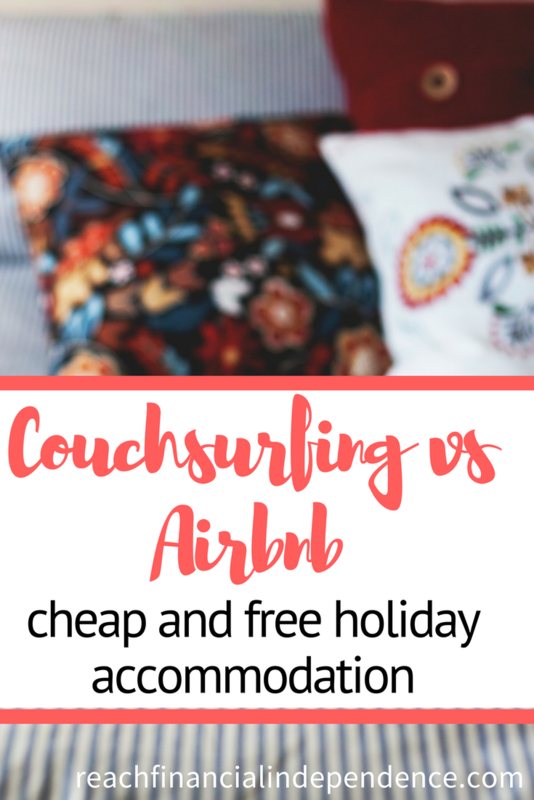 If you are not familiar with Couchsurfing (CS), it is an hospitality network, where members join as hosts, guests or both, and if you are going on holiday, you can stay on someone’s sofa for a few days for free. I have been a member of CS for over 8 years and this is a concept I absolutely loved at first. Back then we were only about 30 members in Guatemala so we had a lot of requests to host surfers and we did it gladly. We also knew each other so we could host a surfer while another member would show him around and a third take him out for drinks. Most people we hosted had a blast. Then the first sign of abuse started to show. One guy took the “help yourself in my fridge” literally and left with his backpack full of food. Another one let my Guatemalan friends who made $10 a day (AND were hosting him, AND were showing him around) pay for his round of drinks, a third one somehow managed to stay for a full month in my house while I was traveling, my roommate didn’t dare throw him out and since the guy had $200 for a 6 months trip, he thought he’d freeload for a bit more. It is free. The main advantage to the budget traveler using CS is the possibility of finding free accommodation all around the globe. While in Guatemala you can find a hostel for $10 a night or less, scoring free accommodation in the center of a big US or European city can easily save you $150 per night. You see the city with a local’s perspective. Your host will know a few places out of the beaten path, can take you to his favorite bar or to a friend’s concert, introduce you to other interesting people and help you see the city like a local. Location. You can choose your host based on location and stay downtown instead of a cheap motel 45 minutes away. Interesting people. People on CS are generally well travelled, interesting people who are always happy to share life stories and teach you a recipe or a few words in their language. Your travels will be much more interesting and some will become friends. I have made a few really good friends on CS. More than a hotel. When I stay with someone I usually cook diner for them, so I save on going out to eat, which I would have to in a hotel. Same for breakfast, it is much cheaper to eat in. Many hotels charge for wifi, CSers don’t. They sometimes have a bicycle you can borrow, or will give you a ride to the airport. All that adds up to the savings. Perfect for singles. Traveling alone? That is the perfect way to join people instead of being on your own in a hotel room. Referral system. People who have been member for 5 years or more are considered veterans and while the network has grown exponentially, we all have an horror story to share. An American woman accused me of stealing her passport and money (until we found it under her pillow, she had slept with it scared I would rob her during the night). Some other women told me they stayed alone with men who were pretty insistent with them, etc. But the good thing is you can put a bad reference on a host or a guest, so the next people don’t have to go through the same. When I left that woman a bad comment she left one for me but I had it waived by the moderators since none of it was true. Some people are afraid to leave bad comments but you aren’t making the system a favor if you don’t. Limited stay. Most hosts will ask you to limit your stay to 2 or 3 nights, a week being rare, and more almost impossible. Work required. You will have to ask your host in advance, and once they agree to host you, it is nice to exchange a few emails to get to know them. Plus the time you already spent selecting your host and writing a few hosting requests that were turned down, you will need to spend some time before you find a place to stay. Even more if you are looking for a popular destination during summer or the town’s big festival. Complicated for couples. When I was traveling alone it was generally easy to find accommodation but as a couple it gets more complicated. Less hosts have space for 2, even less for families and small groups. You will get a lot of rejection before you find a host. Comfort/privacy/house rules. Finding someone with a guest room and a private bathroom is an exception. Most people offer a couch in the living room and you will have to get out when they go to work and come back after they are back home. I used to give guests a spare key so they could come back to rest during the day but most people won’t. If you are visiting a city in winter, you’ll have to wait in a nearby coffee shop or walk around the block until they get there. You will have to ask permission to use the wifi, the washing machine, and some people won’t allow it. You are (in general) sleeping in the living room so can’t sleep or relax until everyone goes to bed. Your host will take your time. That can be a con if you want to spend all day exploring the city and fall asleep as soon as you go back home. Your host is not a free hotel, most of the time they’ll want to have diner with you and share about your day. When I was a host I understood that on the first day you are tired and want some space but the next day I hope you’ll entertain me with stories from back home. So it is not for people who just want a free place to stay. You don’t save that much. Unless you are a freeloader.While we were in the US, we would take advantage of being hosted to bring a wine and steak diner to our hosts, with desert or some fancy fruits, and a bacon and egg breakfast. The average shop before getting there was $35 or $40 as we brought food for 4 or more people. Compare that to a $45 motel chain with breakfast and a sandwich for diner, we only saved $25 or so, for all the time sacrifice mentioned above. We were happy to have a good meal and conversation but some days we preferred the hotel, or just camped in the wild. It was worth it for 2-3 nights, not for one. Abuse. Like any time a great system is created (based on people sharing and giving and paying it forward), there are people who try to abuse it. The system needs hosts more than it needs guests, yet some people create a profile the day before they go on holiday just to get a free room, and never open their door to a stranger. You don’t have to host but you can have coffee with someone, show them around, share a meal, etc. I got pretty disappointed with my last experiences in CS because my guests were treating me like a free hotel. Now I have restricted the people I am willing to host to people over 25, who have at least hosted one person in the past from their reference list, who are well traveled and who send me a personalized email saying why they want to stay with ME, not a copy paste sent the day before they need a place to crash to 100 people around. I make an exception for the oldest members if they have an unexpected situation and need an emergency place to stay, but not the newbies. Cheaper than a hotel. One of the reasons Airbnb is such a success is you can usually find a room in a central location at half the price of an equivalent hotel. We stayed in Brooklyn for $50 per night. The cheapest hotel at the time was about $80 and a 30 minute drive from Manhattan. Hotels in Brooklyn were way more than $100 a night. Eclectic properties. You can stay on a boat, in a treehouse, in a vintage attic or a modern loft, properties are unique and for the price of a bland 3* hotel room you can find a really special place to make your holiday memorable. More freedom. Since you are paying for a service, renting someone’s extra room, you can do whatever you please with your time. No need to cook for them, share stories, or bond if you don’t want to. Some will give you the keys and you will not see them until you leave. Some hosts try to share tips and even meals with their guests but if that is not your thing you don’t have to. Real room. Rare are the people who rent the couch on the living room, or a mattress on the floor of their dorm room. You generally get a real room with a real bed. Towels and bed sheets are provided unlike in a hostel, or on CS when some people ask you to bring a sleeping bag. Full properties. Some people rent out a full studio or apartment. You can rent it with friends and split the costs. You can have total privacy, use all the amenities available and stay up as late as you want. Reply time. While we were touring Europe on the bike, we didn’t know when we would get to the next city. With CS it was almost impossible to plan accommodation for the next day, people will take 2-3 days to reply. On Airbnb, there is money involved so if you take too long to reply, someone else will get the deal! We were often able to find accommodation for the same night at 5pm. Convenience. With CS, you have to accommodate your host. If they work until 8pm and your train arrives at 10am, you will spend 10 hours carrying your bags around until you can get home. With Airbnb, you find a host that agrees to drop off the keys at the station at 10am and that’s it. Extended stay. Some places have a monthly price. You are paying for the room and utilities, so it is not like you will overstay your welcome after 3 days. Safety. Airbnb has a guarantee both for the host and the guest. If you get there, and the place has nothing to do with the pictures you see, or you don’t feel safe, you can leave and the host won’t be paid. If your guest trashes the place, you can file a claim up to $1,000,000. Price. While most properties on Airbnb are reasonably priced, there is a cost to it. I rented a studio flat in London last summer, and paid more than if I had booked a chain hotel a few months in advance. If you know your dates, and can book early, some hotels have great rates and Airbnb won’t compete. Cancellation. Your host can cancel your reservation a week in advance without a reason. There is a nice customer service that will pick up the slack and try to get you a place for a similar price in a similar neighborhood, but it is still very stressful, and can be expensive if you resort to a hotel stay at the last minute. You still depend on someone. At a hotel, you can show up and 10 minutes later be in your room. With Airbnb the host can be late, impose a check-out time at 8am while the hotel would let you in until 11am, and so on. If you are abroad you will spend on international calls to check where the person is and that will increase the cost of staying, up to a point where a hotel could have been more competitive. It does not usually happen but you are taking the risk. What if your plane gets delayed, will your host still open the door at 2am? While I was really into CS, Airbnb has convinced me that sometimes, it is worth paying for your independence when you have little time to explore a city and want to plan your day as you want. What I love in both is that rather than staying in a chain hotel you get inside a real home and meet real people. Have you used any of those? Why or why not? This post was featured on The Amateur Financier, Eyes on the Dollar, thank you! I hadn’t heard about Airbnb until your post yesterday. Sounds like a pretty cool option. Back in my bachelor days my roommate was on Couchsurfer and we had a few people stay with us. They were all very chill and only stayed a night or two. A couple we hung out with and a couple mostly kept to themselves, but no bad experiences. Matt Becker recently posted..Liebster Award! I have used neither of these options. I typically just get a hotel and don’t really consider alternatives. I have crashed at friend’s houses or apartments in other cities, but typically I end up just getting a hotel because of convenience. Airbnb can be just as convenient, for a place where on top you can cook your meals. If you rent the full place out it is just like a hotel. They don’t take credit card rewards though lol. I have never used any of these, but I do know about them. Again, I don’t know I would actually try it out – a hotel seems safer. Great review by the way! Moneycone recently posted..Good reads from great blogs! I have had money stolen in hotels, never in CS, and the reference system makes it pretty safe. But I do take more safety measures, like not letting valuables around if I go out, while in a hotel I assume my stuff is safe. Great review Pauline. I’ve bern wondering about these two services for a long time. Im ready to try airbnb but CS sounds a little intense for me. I don’t want to be a freeloader, id rather pay someone for their space and then share dinner with them if they’d like. I know what you mean, on CS I always bring food and try to limit my cost to the host to changing the sheets and a hot shower. If you take them out to dinner, they would come out even, but really they do it for the cultural exchange (and to build karma for when they go traveling). I like the paying it forward mentality. I’m not the type of person that is comfortable with couch surfing. I’d rather stay in a hotel or an AirBNB accommodation than couch surf. Saving money isn’t all that important to me when it comes to travelling, but I don’t travel extensively so it’s not necessary. There is another side to long term travel, you get bored in hotels. Meeting locals for a drink or to visit the city is nice, which you can do without being hosted too, they have forums and meetups. I’ve used Airbnb and loved it. We found an awesome place for cheap. The older I get the less comfortable I feel about doing couch surfing. Maybe I feel like I have more to lose? I dunno. As far as AirBnb, I have never used them and would consider them, but I would probably prefer to stay in a hotel where it is much harder for them to cancel on me. That is the main flaw, although Airbnb is apparently setting up a lastminute list to find you a place should your host cancel a few days before. It also gives them a bad ref, like on Ebay so if you go with people who have impeccable refs it is unlikely they’ll cancel. I haven’t used either of these before, but they both sound interesting. Being that I’d most likely travel with my wife, it sounds like Airbnb would be a better option for me. I’ll have to check it out. Yes, Airbnb is more comfortable and you can get some unique places for quite a low price. You can start with the full place before deciding if you are comfortable staying with people. I get your point, after having a few abusive guests, but I try not to let a bad experience ruin it all. Because of you, I’m using Air BnB for the first time this summer. Can’t wait! I Haven’t but a friend of mine uses Airbnb and is very happy about it; and he travels with his family. He claims that I told him about it…:). Thanks for spreading the word haha! I signed up for CS when I lived in France (and another one that the French people talked about Hospitality club) but I was too chicken to stay as a single girl with men (who seemed to be ok accepting me!). And then the reverse was also true. When I was in Paris in October, we used Wimdu on a recommendation of a French friend and had a great stay – the guy changed a light globe during our stay after I texted him one morning, that was impressive! I was on HC too but the site isn’t as nicely designed as CS. I did stay with single men but made sure they have glowing references before (not just “he is nice” which can mean “he is creepy but I am scared to leave a bad ref”). Sounds a little scary…..but I think it’s cool! I would totally do it if I didn’t have my kids with me! there are some family friendly hosts/guests, a few friends of mine stay with their kids and have lots of fun. When I travel, I try not to bother anyone near by. Getting a hotel is just a way to go for me. Peter recently posted..Superflat Culture: What are we becoming? Hotels are perfect for independence and freedom, but I like that you can meet people and also cook meals. As I generally travel for weeks, I crave a home cooked meal once in a while. Elena @ Giveaway recently posted..Terrific Summer Blog Giveaway – Enter Now! I have hosted people in their 40s, and stayed with some in their mid 50s. There are a few older members and they tend to stay within their age range. Generally they also have a guest room, not just a couch in the living room. Pauline!! Thanks for covering these as I was curious about both. After your balanced review, I think we may just do as we have and save for a hotel room and live with the cost but savor the convenience. If we cannot swing the hotel, we just rough it at home;) Have a singing at the mountain top Friday!!! I definitely think it’s going to get harder on CS. I feel like too many people are taking and not enough giving. And as a pair (unless you are two girls) it does seem quite difficult to find hosts. I haven’t used Airbnb yet, but I have used Wimdu, which is basically a clone minus the Airbnb fees. Oh I didn’t know Wimdu had no fees, I guess only the host is being charged then. I find Airbnb’s fees a bit steep but they could build it up in the price and it would still be less than a hotel. It is sad about CS, my friends here blame it on the media only advertising the free stay part of it and not the cultural exchange. Try to find a place in a major city in summer that is almost impossible sadly, and people like me (I hosted about 200 people) get more restrictive after abuses. Btw how do you read posts while traveling? Do you download them to read offline? I load my reader before going offline and have posts ready for a bus ride or an airport wait. Great post, Pauline. I don’t think we would couch surf, but Airbnb would probably work great. We are using VRBO this summer, which I think is more expensive than Airbnb, but still cheaper than hotels and we get a whole house with laundry room and kitchen, very close to the beach. I’m excited! I thought VRBO AIrbnb and Wimdu were similar in price range, but Airbnb offers either a room or the whole place like you are going with VRBO. They have pretty unique places like treehouse and boats too. I’ve been a CS member since 2006 and really fell in love with the whole idea while living in Japan from 2007 and onward. It was only a 20m2 apartment and I hosted about 100 people during my time there and even let them into the place when I wasn’t around (the post box had a combination-lock). It was great to meet so many people, go on vacation with them and share their enthusiasm for this beautiful country when I myself had already become a regular there. Seeing many comments here yet again serves as a reality-check: True CouchSurfers are, the recent popularity of the service aside, few and far between … and that’s a good thing! Whenever I meet one of them, it always feels as if meeting a like-minded spirit, someone with the same DNA. And it’s those people that more than make up for the few times that weren’t so great. Mind you, I have yet to make a single truly bad experience! I would never, never ever charge for hosting people as it would completely and utterly destroy the experience in my mind. Not owing your guests a thing is what makes CS so thoroughly enjoyable; and that doesn’t mean I’m not trying to do my best for them — it’s all about Karma which, strictly spoken, hotels and Airbnb users don’t receive. Presents and dinner invitations are great and are a fun way to reward your host a bit, but it’s the same in reverse: As soon as some for of payment becomes obligatory, all the fun is gone. Thank you Michael for your feedback. I still love the concept and have updated my profile since I wrote this post to welcome surfers again. In hopes to meet more true CSers like I did a few years back, I feel the same way about meeting such wonderful people and am forever grateful to CS for allowing me to meet them. I have only used CouchSurfing. I personally feel that the CouchSurfing experience is more genuine. No money exchange but both parties gain a wonderful moment (in most cases). But I am a little biased since I never used AirBNB. I have couch surfed for 1 1/2 months for a project of mine. It was a cancer adventure roadtrip from Chicago to L.A and back. I am in the middle of CouchSurfing right now. It’s been 2 1/2 months. It’s my last semester of college. I am training myself how to live out of one bag for an extended period of time. This summer I will be biking across America. It will be a webseries titled, Ride the Battle. My team and I will be couch surfing with cancer patients and survivors. After we get their story we will take them to experience a boundless activity. CouchSurfing has brought an abundance of happiness to my life. I am extremely grateful for everyone who has taken me in thus far. I usually wash the hosts dishs. I have helped with “Spring Cleaning”, and fix various household appliances. It makes me mad every time I hear about a couch surfer taking advantage of their host. It makes it harder for me to keep living this lifestyle. Hi Evan, sounds like a great project, I wish you the best of luck with it. After a while you can pretty much feel which guest will be into the real CS spirit and who just wants a free bed. But with all the publicity around it, the former are definitely rare. Hi Chris, I have had the opposite situation, paid an airbnb only to find out the guy was on CS as well! But he was by far one of the best Airbnb host, being used to having people around, while others who just joined Airbnb for the cash had a kind of complex charging you and didn’t know what to say to you when you invade their space. I try to host people who have been hosting already on CS, so it is not a one way thing. I get that if you are a broke student living in a shoebox place you may not have space to host, but being mid 30s now I am not really into meeting 18 year-olds anyway, so it works out best with more seasoned travelers. Really loved your blog. I am planning a trip with my buddies and we want to experience both couchsurfing and airbnb in such a big city. Awesome , Well Written Blog ! ohh! I love Newyork Its always have been Fav. place. What I like is the accommodation. The post is quite good . I really like your idea but I think this is not a good choice for a big family . ‘To book a Hotel at affordable prize is a better options for them. And one of the best advantage of finding the hotel is you will get proper accomodation and you can enjoy your vacations. For me – I think I would prefer Airbnb as gives some boundaries and guidelines for what is expected etc on each side. Holiday accommodations are best place in my opinion. They provide you the best of facility ever. One can plan a tour with their holidays to know more about the accommodation.